Kendal was born in Pryor but spent most of her childhood and teenage years in New Jersey. She moved back to Pryor in 1999, when she began her insurance career. 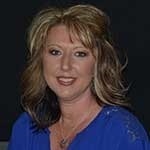 Her main focus has been commercial lines, but she has also spent some time working in the Tribal Insurance Department. Kendal joined the RCI Team in 2014 and heads up our bonds department, as well as handles the quality assurance on new policies. When Kendal is not at work she enjoys spending time with her husband and 3 kids. Her kids keep her extremely busy with soccer, baseball and piano. Given the chance, Kendal loves to travel. Recently, she was able to take the family to the Grand Canyon, then spend some time on the beach with her husband.